Order Option #6: Fully wired "plug-in-play" wire harnesses. 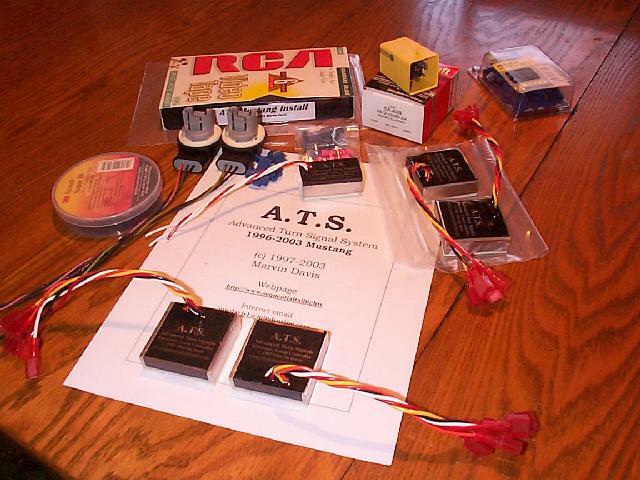 Complete kit for normal ATS installations, and provides all needed hardware components to install the ATS system on a new model Mustang outside labor and required handtools. Kit includes complete socket assemblies which speed the installation. Rebate offer on order form for the removed flasher module and socket cores which reduce the overall cost of the kit! Most folks choose this system as it gives the most bang for the buck for features and lowest cost. Unless you have special or custom needs, this kit is all that is normally required. Complete kit for normal installation like above but includes a fully adjustable precision flasher module. This will allow you to "tune" the system look for your particular taste! Range is from 40-60 FPM (+/- 2 FPM) and is shipped with a calibrated setting of 50 FPM (medium speed). This allows you to setup for a slow, medium or fast speed/look. If you would like to see spec's or additional info on the FLA-4060a turn signal flasher, click here! Complete kit for ATS installations that provide for an additional level of control for professional installers who wish to have independent control over the ATS lamp controller to force the unit to not delay lamp firing. This is useful for those who have third-party lighting systems (like Gall's or Weland Traffic backer systems) where the sequential delayed lighting causes problems or incorrect operation with these systems. By using the disable option control line to the power going to the traffic backer unit, you can force the ATS controllers to not delay lamp operation and the traffic backer controller and lamp operation act just like stock lighting. Unless you have custom of specific control needs, you do not normally need this. Advanced systems now include fully adjustable precision flasher module! This is also a special order item as I normally do not stock many of these systems and may be built to order if currently out of stock. If you have an immediate need, email me for current stock availability. Typical restocking time is about two weeks. This is a support module or "add-on" to the advanced system (order option #3). This kit contains a small electronic control module and connectors to be able to tap into the CHMSL (center high mounted stop light) or 3rd. Brakelight and send a signal to the ATS Advanced system (Order option #3). This will allow completely stock brakelight operation (no staged on brakelights). You can also place a switch in this line to allow you to switch between stock and staged on brakelights depending on your personal taste. Many folks like staged on brakelights as they attract more attention to your vehicle in traffic when applying brakes. The exploding brakelight look can help avoid rear-end collisions in heavy traffic. If you desire completely stock brakelight operation that does not interfere with the sequential turn signals look, you can accomplish this using this add-on component. Retrofit back to stock kit. This kit contains connectors and adapter harness connections to be able to remove the ATS controller from the vehicle and restore stock brake/turn signal operation. You can select from standard two brake/turn signal lights, as you have stock or connect up the third brakelight socket for three brake/turn signal bulb operation. Since the ATS system is not a permanent modification (as when you solder connections) you can restore or move the ATS system to another car anytime you need. This short video (about 30 min's) shows an installation on a 1999 Mustang. The video is not required to see in order to do the ATS installation but provides some hands-on information for those unfamiliar with lamp wiring, etc. The included written step-by-step manual is detailed and specific and the video helps to show the needed installation steps. System checkout and examples of rear taillight operations are shown. Fully wired "plug-in-play" wire harnesses. This option is for those who wish to install an ATS system without doing any wire cutting and installing connectors and allows you to quickly and easily remove your factory rear wire harness assemblies (via rear trunk bulkhead connectors) out through the rubber trunk grommets. You now can then install new modified factory wire harnesses with sequential controllers already pre-wired with labeled connectors and numbered sockets and in only minutes have your system up and running with minimal time and effort. Allow extra time when ordering as these are built to order. NOTE: This wire harness option is just that, a set of complete modified replacement factory wire harnesses. It does not include electronics and is NOT complete sequential turn signal system of itself. It simply allows a complete install without any wire cutting or installing/crimping connectors and has all the necessary extra wiring and need components for a "painless" install. Since you will have to remove and replace the underdash flasher control box with the one provided in the ATS kit, I will purchase your old unit and the removed tail light sockets (no longer needed) for $15.00. This will reduce the overall cost of the system kit. Simply box the flasher and sockets up and mail it to me on the address listed on the order form within 60 days of purchase, and I will send the rebate to you. Be sure to include your name and address so it will be processed fast and correctly!. Rebates sent out within 1-2 business days of receipt.